It was an experiment in the possibilities of solo gaming that occurred to me at work. I genuinely have no recollection of why this struck me when it did, but I had the thought that one or two of the classic Fighting Fantasy books might provide an interesting challenge as solo sessions for The Cthulhu Hack. Recently re-released, could I fend off the threat of the House of Hell? What adjustments did I need to make? 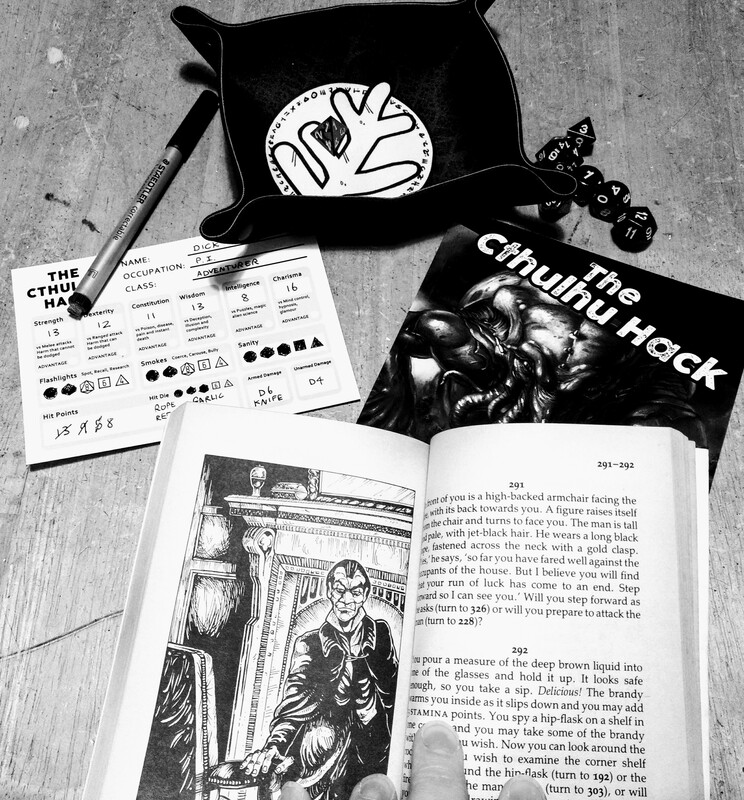 Create a character as normal for The Cthulhu Hack. That means rolling all your Saves and setting the dice to your investigative resources. You don’t really needs to consider Special Abilities – if you want to give yourself a break, assume that you have the option of Topped-Up Hip Flask that can restore D6 hit points once per session and On The Hop that allows you to burn a Flashlights or Smokes to score an automatic success with an attack. When the book asks you to Test Your Skill or Test Your Luck, make a judgement on what Save to roll, with a touch of honesty. If you’re in a situation with people trying to overcome your sense of self or with hypnosis, it’ll be Charisma. Genuine luck, roll Wisdom. Dodging a trap, roll Dexterity. Releasing something or facing a melee attack, roll Strength. Just opt for a Save that feels right. Investigative Resources are harder to judge. I’m tempted to use these as burnable resources. If you have a choice, keep a note of the paragraph you’re on and make it. If you turn to the choice and it either kills you straight off the bat or causes you to lose Hit Points, lose a dice from your Resources and go back to make another choice. I know… it isn’t entirely in the spirit of The Cthulhu Hack, but it at least provides a mechanic for that thing we all do anyway when reading a solo gamebook! Most standard fights will lend themselves to Strength or Dexterity, as normal. Take the Skill of your opponent, as listed, and divide by three, rounding down fractions. Check the Average Antagonist chart (pg 19 in the current core book) and assume they have that number of Hit Dice, for calculating damage and armour. Yes, you’re going to die. Most creatures in the game will probably have 2 or 3 Hit Dice, inflicting 3 or 4 damage. You can actually choose whether to roll damage or suffer a fixed amount. When inflicting damage yourself, roll as you would in normal group play. When you suffer any damage, deduct it from your Hit Points. Stamina deductions work the same way – coming off as Hit Points. When you strike a foe, the same applies – deduct whatever you roll from their Stamina. Oh, and remember – you start this adventure off unarmed. Until the book tells you that you’ve found a weapon, you’re stuck tackling fights with your bare hands. And most enemies will have a point of armour, as 2HD opponents. The game includes the addition of Fear, on top of the standard Skill, Stamina and Luck. Whenever the book asks you to deduct Fear points, roll your Sanity resource instead. If you run out of Sanity, you lose the game – just as you would in the original by running your Fear up to the threshold. If you somehow uncover a way to restore Fear, add a die back to your Sanity. Adopt a similar approach to recovery when handling Hit Points, restoring the amount indicate for Stamina.